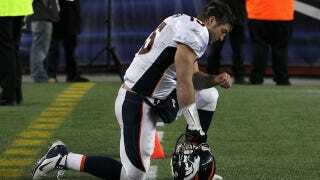 Steinbeckian simpleton Tim Tebow is a divisive figure. On one hand, he was in that obnoxious Super Bowl commercial where his mom implied that women who die in chldbirth aren't tough enough, he's really seems to think that God cares about football and he's been known to spend free time "converting" Catholic Filipinos into more sensible evangelical Tebowian Christians. On the other hand, America loves few things more than a big, gentle, soft-hearted dummy. And sometimes he acts like an incredibly decent guy. Take, for example, his friendship with 22-year-old cancer survivor Kelly Faughnan. In late 2009, Kelly was on a trip to Disney World with her parents, having recently emerged from successful surgery on a brain tumor. Prior to her battle with cancer, she has suffered from some hearing loss since birth and a small tremor since her tween years. At the time, Tebow was quarterbacking the Florida Gators and every person in America's Wang (except for Florida State fans) was salivating over the quarterback. He was a popular guy. Kelly and her father knew Tebow was in town, and tried to position themselves in a place at ESPNZone that might put them in a good position for a Tebow sighting. He ended up not only stopping by the restaurant, but picking Kelly and her family out of the crowd to come and hang out with him. During their subsequent hang out session, Tebow asked Kelly if she'd be his date to the next night's College Football Awards. She didn't have a dress, so the next day, she scrambled to assemble the proper attire, and the two had an evening of magic and laughter. After that, the two stayed in touch, exchanging gifts and notes. Tim's foundation flew Kelly and her family to Denver to attend a game, and Kelly was allowed onto the field to high five her buddy. Kelly's faith is similarly important to her as Tebow's is to him and she calls the two "God-friends." Minus the whole God part, this is exactly how I dreamed I'd become friends with former Minnesota Twin Torii Hunter when I was a teenager (except in my Torii n' Me Kickin' It fantasy, there was skateboarding), but it never happened. Good on you, Kelly. And, high five to go with all those Tens for Tim Tebow.